1. Abscission: Premature fall of flowers and fruits, leaf fall, leaf curl. 2. Chlorosis: Non development of chlorophyll. 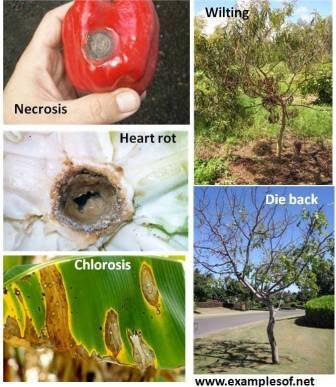 This symptom is caused by the deficiency of elements like Nitrogen, Potassium(K), Magnesium (Mg), Sulphur (S), iron (Fe), Manganese (Mn), Zinc (Zn) and Molybdenum (Mo). 3. Die back: Killing of root apex. 4. Dwarfing is under development of a plant or plant organs due to inadequate nutrition. 5. Internal or Heart rot: Softening or rotting of internal tissues, external cracks. 6. Little leaf disease: Leaves are quite small in size. 7. Mottling: Patches of green and non green areas. 8. Necrosis: Death of tissues, stunted growth. It is due to the deficiency of CA, Mg, Cu, K, Lack or low level of N, K, S, mo causes an inhibition of cell division. 9. White bud: Chlorosis affecting young leaves as well as buds so that the latter are whitish instead of greenish colour. 10. Wilting: Loss of turgor, internal cork.